I'm back with another week of Wordless Wednesday hosted by Deb at Focused on the Magic. This weeks theme is: The letter "A". I think Deb has been watching too much Sesame Street. If next weeks post is brought to you by the number "7", then we'll need to have a word with her. This week my son is away on his year end school trip. They've gone to some island where there are no electronics allowed, and I'm pretty sure he's made a few attempts to swim to the mainland by now. Three days without the internet is probably the worst thing you could do to that boy. I don't know where he gets this inability to survive without technology from. Really though, what's a visit to Disneyland without being stuck on Space Mountain at least once? 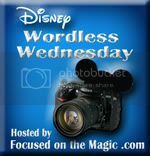 This post is a part of Wordless Wednesday over at Focused on the Magic. If you didn't get here from there, you should really head on over and check out some of the fantastic people that hang out there on Wednesdays. Most of them probably didn't need to use a dictionary to come up with enough "A" words for their post, although I'm betting a few of us would have to explain to our kids what a dictionary actually is (It's like an alphabetical Google kids).